I suspect for much of the mainstream, there are two moments for which Al Jarreau’s music most resonates: the theme to Moonlighting, the mid-1980s television series which starred Cybill Shepherd and introduced the world to Bruce Willis, and his breakthrough hit “We’re in this Love Together.” Trust that someone will describe Mr. Jarreau, on the occasion of his death, as a “one-hit” wonder, which may be more apropos than most fans would admit, in spite of his seven Grammy Awards. Mr. Jarreau was that something more elusive than stints on the Pop charts; for more than 40 years Mr. Jarreau danced on the margins of Jazz, R&B and Pop to create a career that was as unique as his vocal style -- a style which might be best described as fits of facial contortion and spastic movements embodied in the finest of vocal improvisational skills. Mr. Jarreau was born in Milwaukee, USA, in 1940 and was a working professional in San Francisco when he began to gig on the side with a young George Duke in the late 1960s. By the end of the that decade Mr. Jarreau decided to pursue his career as a jazz vocalist fulltime, finally releasing his first studio album, the now iconic We Got By in 1975. Mr. Jarreau might have been remembered as a fine interpreter and improviser, had Warner Brothers not chose to capture part of his 1977 European tour and release it as a live double album, Look to the Rainbow. The album, which featured a vocal version of the Jazz standard “Take Five,” as well as a Leon Russell cover (“Rainbow in Your Eyes”), and a striking rendition of his own “We Got By” (which serves as closer), earned Mr. Jarreau his first Grammy Award in 1977 for Best Jazz Vocal Performance. With the success of Street Life (1979) by The Crusaders, which more intentionally engaged the mainstream R&B and Funk of the late 1970s and featured vocals by future collaborator Randy Crawford, Mr. Jarreau’s fourth studio album reflected a glossier more urbane sound -- and it was his most successful album to date, with the single “Never Given’ Up” becoming his first top-ten R&B hit. It was with that momentum that Mr. Jarreau recorded what remains his most successful album Breaking Away, which topped the R&B and Jazz album charts and was his only top-10 Pop album. 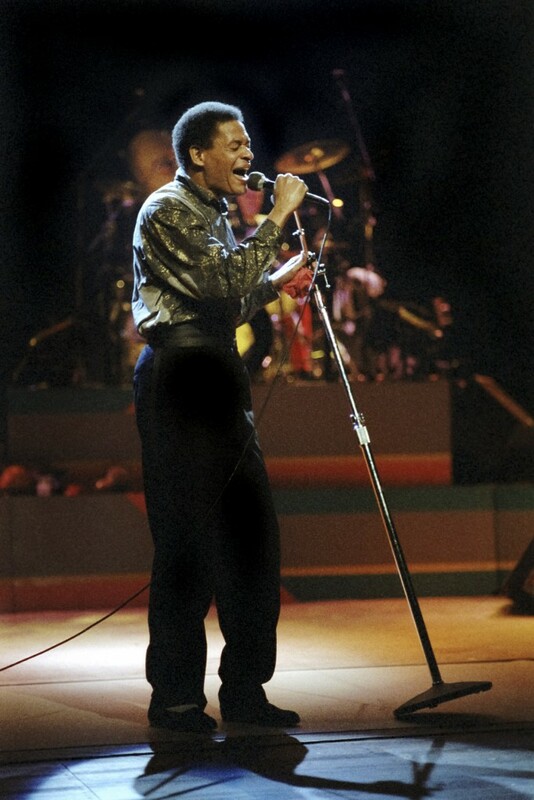 Perhaps taking a page from Grover Washington’s collaboration with Bill Withers on “Just the Two of Us” Breakin’ Away’s breakout hit was the lilting Pop ditty called “We’re in This Love Together” which found Pop favor amidst the death of all things Disco and the rumblings of New Wave; the album earned Mr. Jarreau the Grammy for Best Male Pop Vocal Performance in 1982. “Mornin’” -- the kind of song that morning drive-time DJs and programmers still love -- became Mr. Jarreau’s second major pop hit with the release of his 6th studio album Jarreau (1983). Mr. Jarreau even managed to have his version of the “Big 1980s Pop Ballad” with “After All” (High Crime, 1984), though Mr. Jarreau’s Pop success was largely behind him. The “Moonlighting” Theme (1987), which was produced by Nile Rodgers, was Mr. Jarreau’s last Pop hit, though ironically “So Good,” which appeared on Heart’s Horizon the next year, was his highest charting R&B song. For the next two decades Mr. Jarreau would continue to make fine records, pivoting more towards the so-called Smooth Jazz sounds -- that arguably he, the late Grover Washington and Patti Austin were responsible for incubating -- and touring profusely throughout the globe. Mr. Jarreau won his last Grammy Awards in 2007, at age 66, for a duet project with legendary guitarist George Benson, including the Best Traditional R&B Performance for “God Bless the Child” which featured Jill Scott. While Mr. Jarreau’s studio albums are indeed a tribute to his art and career, the many who were fortunate to hear him live, where album cuts like “Roof Garden” (Breakin’ Away) became tour-de-force performances, know that there was so much more. Folks would do well to track down a copy of Casino Nights, recorded live in Montreux, where Mr. Jarreau and Randy Crawford trade bars on tracks like “Who’s Right, Who’s Wrong” and Marvin Gaye and Tammi Terrell’s classic “Your Precious Love.” And if there might be a way to bookend Mr. Jarreau’s genius, it would be 1977’s Look to the Rainbow and his 1994 live gem Tenderness, which may also serve as the best introduction to his talents. Yet there are other obscure moments; Mr. Jarreau remixed with the late Phife on “In My Music” from Tomorrow Today (2000) or his joining forces with the late Kashif to celebrate summers in Edgartown. Vocally, Mr. Jarreau was a reminder that Doug E Fresh, Biz Markie, Dianne Reeves, Erykah Badu and yes, Lil’ Wayne did not occur in a vacuum, as Mr. Jarreau himself was indebted to Billie Holliday, Ella Fitzgerald, Lambert (Dave), Hendricks (John) and Ross (Annie) and Louis Armstrong. Mr. Jarreau’s commitment to always take the music to the people -- wherever the people may be -- might be his lasting testament; Mr. Jarreau was on-tour, literally until days before his death. Mark Anthony Neal has been conjuring analog for a digital world for a long time; Check him out at @NewBlackMan + @LeftofBlack + BookerBBBrown on the ‘Gram + and the homebase at NewBlackMan (in Exile).